Our list based dialing system is a stand alone product that simply makes a call and connects to available operators. We have no limits in place as to the amount of calls that can be simultaneously made, however due to compliance regulations we can only connect to available operators. This product can also be used in conjunction with Event initiation and call broadcast. 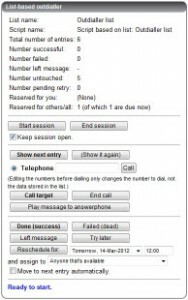 These added features greatly enhance the capability’s of our cloud dialer making the service into a dynamic manageable contact data base with options to call back, send SMS , broadcast events and e-mail. Additional operator features and reporting.